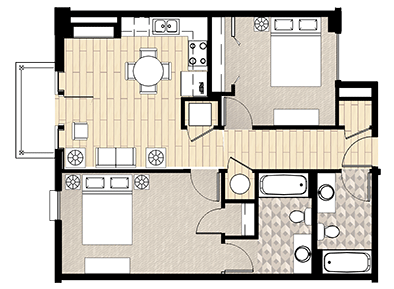 Floor Plan D features a spacious combined living/kitchen area with a private balcony and a pantry closet for added storage, and a walk-in closet in the bedroom. 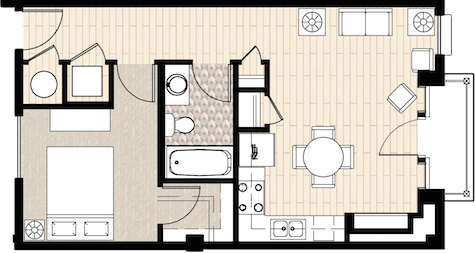 Furniture: Ask about renting this floor plan custom-furnished with elegant designer furnishings. Utilities: Resident pays $40.00 for water and trash. 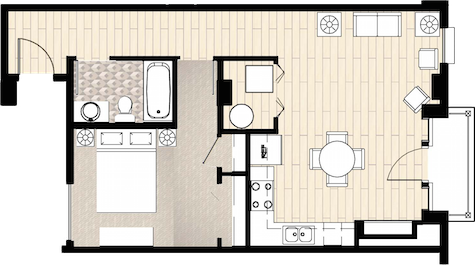 Floor Plan C features a spacious combined living and dining area with a private balcony. 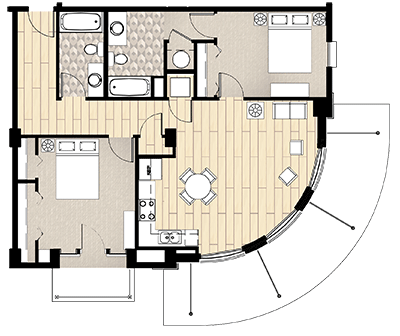 Floor Plan A features a spacious bedroom with two closets, an attached master bath, a separate hall bath for guests, and a private balcony off of the living room. 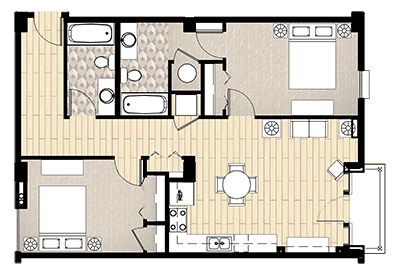 Floor Plan G features a spacious living/kitchen area, a private balcony off the living room, an entryway coat closet, and a spacious master bedroom with a private Juliet balcony. 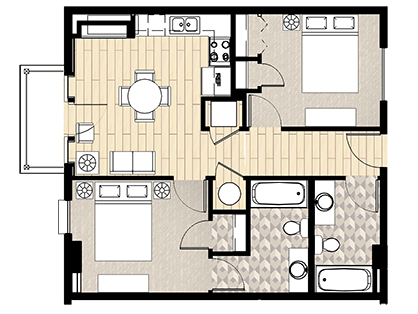 Floor Plan G features a spacious living/kitchen area, a private balcony off the kitchen area with stunning views of Downtown Athens, a separate pantry closet for added storage, a desk nook, a spacious master bedroom with two closets, an attached master bath, and a half-bath in the hallway for guests. 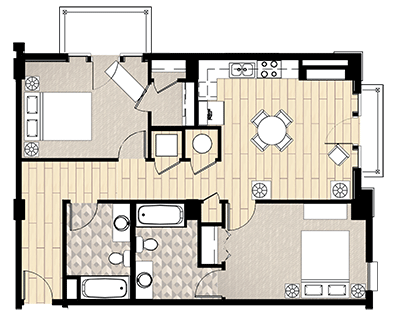 Floor Plan H features a private balcony off of the living/kitchen area, two bedrooms, an attached master bath, and a second full-sized hallway bath. Utilities: Resident pays $50.00 for water and trash. 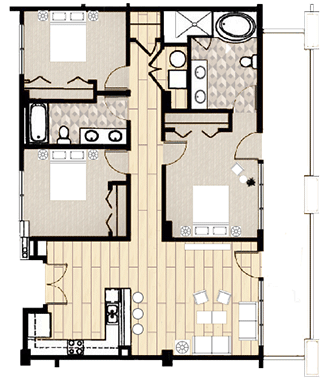 Floor Plan I features a private balcony off of the living/kitchen area, two bedrooms, an attached master bath, and a second full-sized hallway bath. 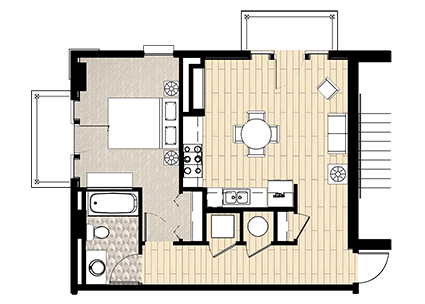 Floor Plan E features a spacious combined living/kitchen area, two bedrooms, an attached master bath, a second full-sized bath in hallway, and a private balcony off of the living room. 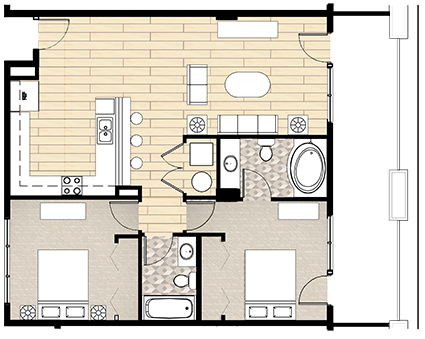 Floor Plan F features a spacious combined living/kitchen area, two bedrooms, an attached master bath, a second full-sized bath in hallway, a private balcony off of the second bedroom, and a Juliet balcony off of the living room. 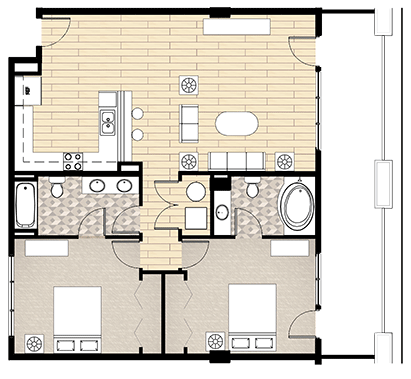 Floor Plan B features floor-to-ceiling windows in the living room overlooking beautiful Downtown Athens, two spacious bedrooms with one attached master bath and one full-sized hallway bath, and a private balcony off of the second bedroom. 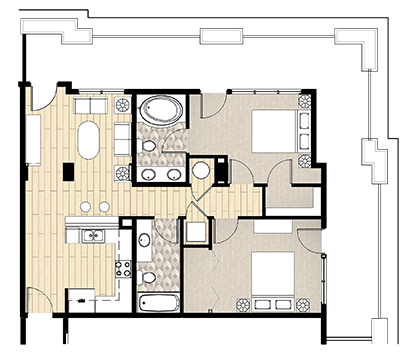 Floor Plan Combo 2 features an expansive open kitchen and living room, a sophisticated bar area for entertaining, a private balcony off of the kitchen, a second private balcony off of the living room, two spacious bedrooms, an attached master bath with a jacuzzi tub and a standalone shower, attached bath in second bedroom, and a half bath in the hallway for guests. Utilities: Resident pays $60.00 for water and trash. 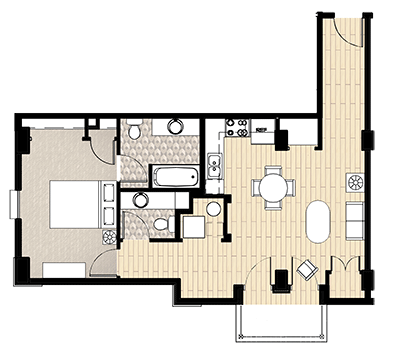 Floor Plan Combo 3 features three spacious bedrooms, all with attached bathrooms; a half-bath in the hallway for guests; and two private balconies (one off of the living room and one off of the master bedroom), both with stunning views of Downtown Athens. Penthouse 1 features an expansive living area, near floor-to-ceiling windows in living room and master bedroom, an extended private balcony with access from the living room and the master bedroom, 12 foot ceilings, a breakfast bar, three bedrooms, a sumptuous master bathroom with a soaker tub and a standalone shower, and an additional full-sized hallway bath with double sinks. Furniture: Ask about our elegant furniture package for this apartment. 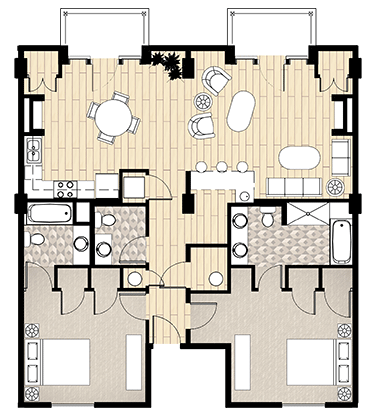 Penthouse 5 features an expansive living area, near floor-to-ceiling windows in living room and master bedroom, an extended private balcony with access from the living room and the master bedroom, 12 foot ceilings, a breakfast bar, two bedrooms, an attached master bath with soaker tub, and an additional full-sized hallway bath with double sinks. 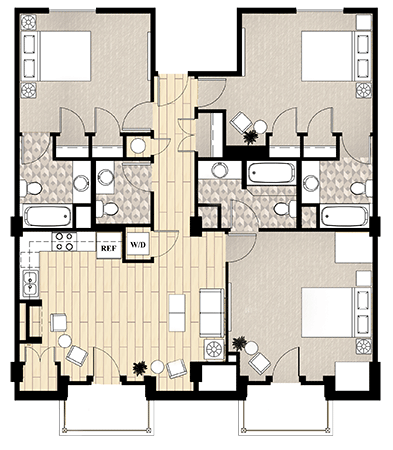 Penthouse 6 features an expansive living are, near floor-to-ceiling windows in living room and master bedroom, a custom city-scape wall mural, 12 foot ceilings, a breakfast bar, an expanded private balcony, two bedrooms, an attached master bath with soaker tub, and an additional full-sized hallway bath with double sinks. Penthouse 7 features a unique archway passing from kitchen to living room, near floor-to-ceiling windows in living room and master bedroom, a breakfast bar, a huge wraparound balcony with panoramic city views, two bedrooms, an attached master bath with soaker tub, and an additional full-sized hallway bath with double sinks.